If you've ever had a bad trip after a merry-go-round ride or a goofed handstand, you know that the disorientation that dizziness causes is nothing to be sniffed at. And yet bats, sloths, and other animals that spend a fair bit of time upside down seem to have figured out how to beat the spins. National Geographic explains that bats, which can weigh as little as 0.07 ounces, simply don't have enough mass for the force of gravity to throw their circulatory systems for a loop. Even these orphaned grey-headed flying foxes, which might max out at 2.5 pounds each after they've outgrown their tiny blankies, can look forward to an effortlessly upside-down lifestyle. Humans, on the other hand, tend to have around 2 gallons of blood in their bodies—which is, according to National Geographic, "a lot of liquid suddenly rushing to your head if you were to hang upside down." Sloths have a little more meat on their bones, so they can’t rely on gravity cutting them a break. They manage to keep a steady gait thanks to a unique quality of their own: a continental drift-like cruising speed. 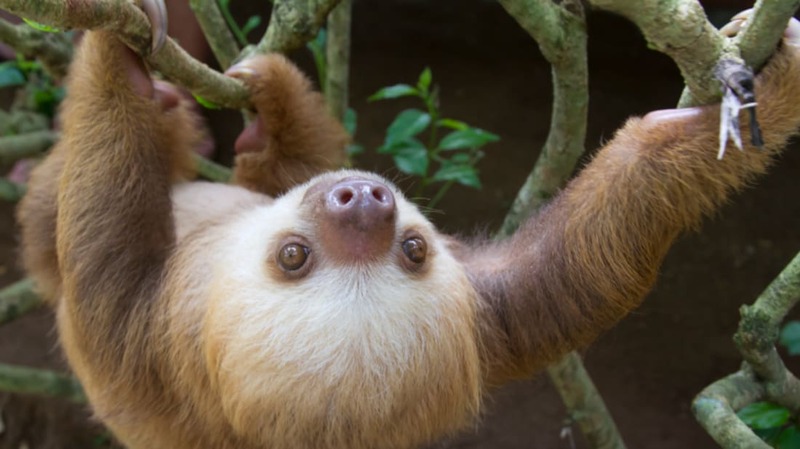 National Geographic explains that sloths move so slowly along the undersides of branches that the fluid contained between their inner and outer ears—which, as in humans, is part of a complex system that provides a sense of balance—”is always stable, which prevents them from getting dizzy." The Smithsonian National Zoo’s associate director Don Moore told the site that two-toed sloths are also able to navigate while vertically flipped because they keep their heads still and pointed toward the next bit of tree they’ll be clinging to. Three-toed sloths, however—in addition to being “fabulous at moving very, very slowly up in the treetops and looking like a clump of algae"—can actually “flip their heads 180 degrees when they’re moving horizontally" to keep an eye on the path ahead, Moore said. This doesn’t mean it’s easy, though; these baby sloths still have a lot to learn about climbing while inverted and delightfully fuzzy.